﻿ Hill Motel, Gyeongju-si | FROM $37 - SAVE ON AGODA! "Spacious room, clean and neat"
Have a question for Hill Motel? When visiting Gyeongju-si, you'll feel right at home at Hill Motel, which offers quality accommodation and great service. From here, guests can enjoy easy access to all that the lively city has to offer. A haven of rest and relaxation, the hotel will offer total renewal just steps away from the city's numerous attractions such as Bulguksa Temple, Seokguram, Seokguram Grotto. Offering hotel guests superior services and a broad range of amenities, Hill Motel is committed to ensuring that your stay is as comfortable as possible. To name a few of the hotel's facilities, there are 24-hour room service, free Wi-Fi in all rooms, 24-hour front desk, express check-in/check-out, Wi-Fi in public areas. The hotel features 17 beautifully appointed guest rooms, many of which include television LCD/plasma screen, internet access – wireless, internet access – wireless (complimentary), air conditioning, heating. The hotel's sauna are ideal places to relax and unwind after a busy day. 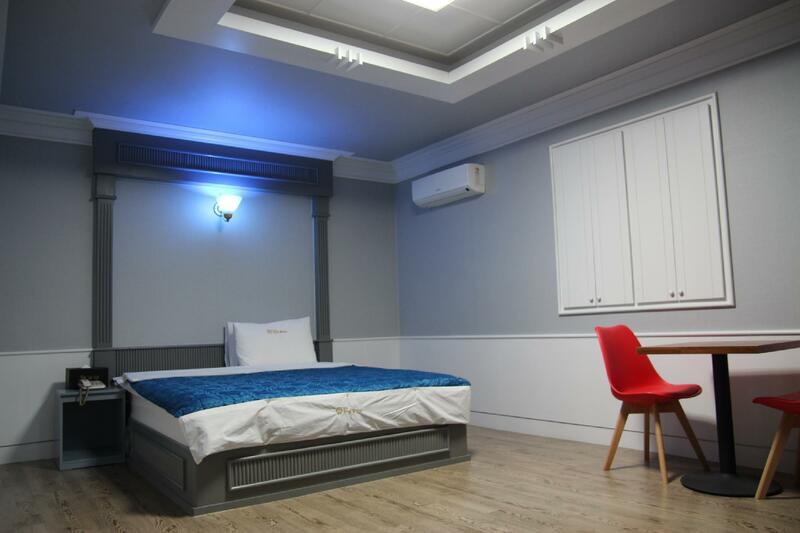 When you are looking for comfortable and convenient accommodations in Gyeongju-si, make Hill Motel your home away from home. A bit far away from downtown but nice price wif nice service and the room quite big. clean. kind owner. comfortable staying. It was quite dark on the way there at night. But distance from the city site(BoMun lake) is close. And the best thing of this motel is cleanness. It is great to use for families and friends. Hill Motel is fine for a night's stay, but it is nothing special. With ample car parking this motel is easy to drive to. Bed felt extremely stiff to my mother, who is not accustomed to Korean mattresses. Accommodation style was basic but our room was quite large. Innkeeper was an old Korean lady who did not speak English, but was friendly and we had no problem getting the room when we showed her the Agoda printout. Best part of this hotel is the location, which is close to the Bulguksa Temple and the Seokguram Grotto. You will want to get those places early in the morning because they get crowded quickly. The location was far from the downtown but it was a nice change. Its near the Bulguksa temple and parks. There are afew restaurant near by. The scenery was breathtaking. Cherry blossoms everywhere. Location quite near Bulguksa Temple and eatery... but when we arrived nobody was in the reception area. Waited for 1/2 hour and went to eat first. 편의점(GS25)이 걸어서 7~8분 걸이에 있어 좀 멀어요..
경주 여행 도중 주말에 불국사와 석굴암을 방문하기 위해 이 지역 숙소를 검색하다가 예약했습니다. 차가 있었기 때문에 주차가 편한 곳을 골랐습니다. 위치가 불국사 바로 옆인 대신 보문단지와 경주시내로의 이동은 버스가 다니기는 하지만 개인 차가 없으면 불편합니다. 주말이고 가을단풍철이기도 해서 그런지 오전 9시 이후에는 일대가 주차장이 되어서 차들이 움직이지 못하기 때문에 숙소에 차를 두고 도보로 다녀오는 게 좋습니다. 이름대로 시설은 모텔입니다. 욕실은 낡은 티가 나고 물에서 이상한 냄새가 나기는 했지만 큰 문제는 없었고(샤워기에 정수기도 달려 있었습니다) 수건도 넉넉하게 제공하고 목욕용품도 전부 갖추어져 있습니다. 방은 혼자 쓰기에 너무 넓고 깨끗하고 미니 냉장고에 생수와 몇가지 음료도 기본으로 제공되고 있습니다. 침대에 전기요도 깔려 있어서 밤에 춥지 않게 잘 잤습니다. 단 건물 내 부대시설은 주차장 이외 존재하지 않는다고 보면 되고 주변 음식점은 해가 떨어지면 거의 모든 곳이 닫기 때문에 모텔에서 인포메이션으로 제공한 음식점으로 전화주문해서 먹거나 외부에서 돌아올 때 미리 사와야 합니다. 간혹 열려있는 까페도 음료만 가능하고 주방은 문을 닫아 20시 이전에 가도 주문이 불가했습니다. 단점은 있지만 가성비 좋은 숙소이면서 조용하고 신경쓸 일이 거의 없어서 편하게 쉬다 왔습니다.